Viaje a Madrid 4e y 3e, 29-31 marzo 2017. On the 29th of march our class and the class of 3ème left to go Madrid, we had to be at the airport at 7 :15am and we left to Madrid at 8am. The teachers who came with us were Camel, Marisa, Victoria and Jesus. When we arrived at Madrid we met Helen our guide for our 3 day field trip. When we left the airport we went to the hotel and we dropped off our luggage. And then we went straight to La Plaza De España. We were there during 1 hour and 30 minutes then we went to eat at a Buffet. After eating we went to La Puerta del Sol and during 1 hour we went shopping, after shopping we came back to La Plaza to have a guided tour of Madrid. Then we went to the hotel for free time during 1 hour to get changed and take a break. We then went to the Theater to see « La Bicicletas son para el verano ». After the Theater we went to Mcdonald’s and Shana got her phone stolen. We woke up at 7:15am and had breakfast, then we went to “El Retiro” to have a guided tour guide of the park, when we finished the tour we went to do some sport with Columbia a friend of Helen. Then we went to a Museum “El Prado” to observe paintings with perspective, after this we went to eat a restaurant called “Vips”. Then we went to “Gran Via” to do some more shopping. When were done shopping we went to see “The Lion King”. 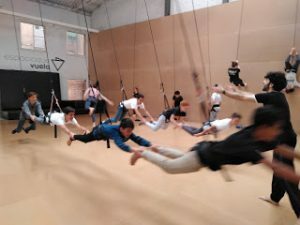 When we woke up and had breakfast we went to vuela an activity where you are attatched to a rope and you could fly. After Vuela we went to a Museum of Trains. We then went to Hard Rock to have lunch, after lunch we went back to the hotel to take our bags and go to the airport. In the Airport we had one hour of free time. And then we took our plane to go back to Ibiza. At 7 am in the morning, we were all waiting so happy to leave to Madrid. At 9h30 we arrived to Madrid . we visted Madrid de los Austrias which was very beautiful. After that we went to eat at to a buffet is was delicious. We then visted Palacio real where there was a prime minster coming out with all of his guards. All of use went to a show. The show was talking about civil war in Spain . after that we were all tried so we went to the hotel to sleep. The teachers woke us up at 8 am in the morning. We were all so tried but we knew that we were going to past a good day. 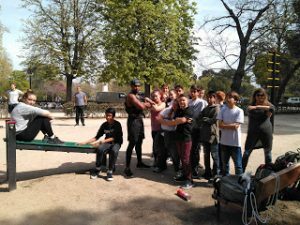 So the day started with a bike ride in Retiro ( a park ).we all did a physical sport with muscle man. The bike ride was very funny and we past a good time between friends. We ate at a restaurant then went to vist the museum of Prado. We went to watch another show Rey Lion its was amazing. After that for dinner we ate at a Italian restaurant. Another day finished . 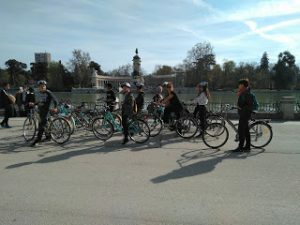 Wednesday 29 February we went to Madrid, to visit or see (for example el Rey Leon and las bicicletas son para el verano ). The first day we went to an Egyptian Temple and Madrid de los austrias also went to eat at a free buffet and for dinner a McDonald’s. The second day we went to a guided bike in El Retiro than a group towards the other group to gym with a man called Colombia. Then we went to eat at a vips and then went to see the El Rey Leon. In Madrid we visited the city, after we ate in the selfe. We had a visit guided. In night we went to the theatre “Las bicyclettas son para el verano”, after we ate to Mcdo. And we returned in the hotel. We went in the park, we had a bike, and the body-building, we ate in a restaurant « vibs », after we went to a museum “el prado”. In night we went tot he theatre “El rey león”, we ate in the selfe. We had one activited its a dance with arnes, and a museum of trains, and we went to the airport for returned to IBIZA. 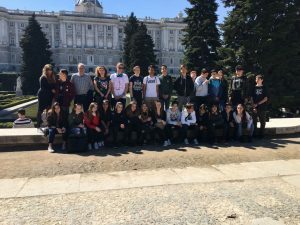 On Wednesday we went to Madrid for a school trip of 3 days, barely arrived we took a bus to the hotel management to leave our luggage then we met our guide that we would visit a park of Madrid. Then we went eating at a buffet, and then we visited Madrid de los austrias with another guide (it was boring) Finally we went to the hotel. The next day, after breakfast, we took the subway to head has a park or a bike tour has been, after we did dance and sport with a friend of our guide. We arrived to Madrid the 29th of march at 9h30am, we met our guide and we took the bus for went to the hotel Room007. After we visited the temple of debod in the west of Plaza de España, we passed next to the Royal Palace and we went to a buffet. After eat we went to « puerta del sol » and we seen the place where the kilometres start of Spain since 1950, we had 1h for shopping and we start a visit guided in « Madrid de los Austrias ». We returned to the hotel for free time and we walk to the theatre to see « Las bicicletas son para el verano » , then we went dinner to Mcdonald´s where Shana´s phone was stolen. 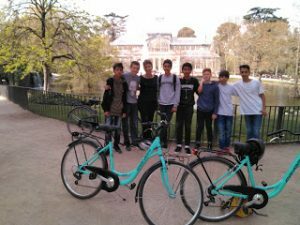 The second day we went to “ El Retiro” , there we had a visit guided in bike while the other half of our was doing “street work out” with Helen and his friends, then we eat in “Vips” and we visited the museum “El Prado”. Then we had 2h of shopping in the “Primark”, we went to see “El Rey Leon” in “Gran Via” and we dinner in “Tropolino”. 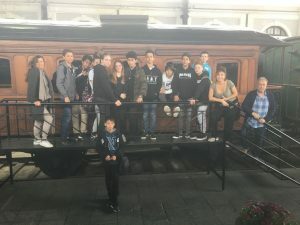 The last day we did the activity of « Vuela » while the other half of our visited « El museo del Ferrocarril », then we eat in the « Hard Rock » and we returned to the airport in bus and we arrived to Ibiza at 21.30pm.